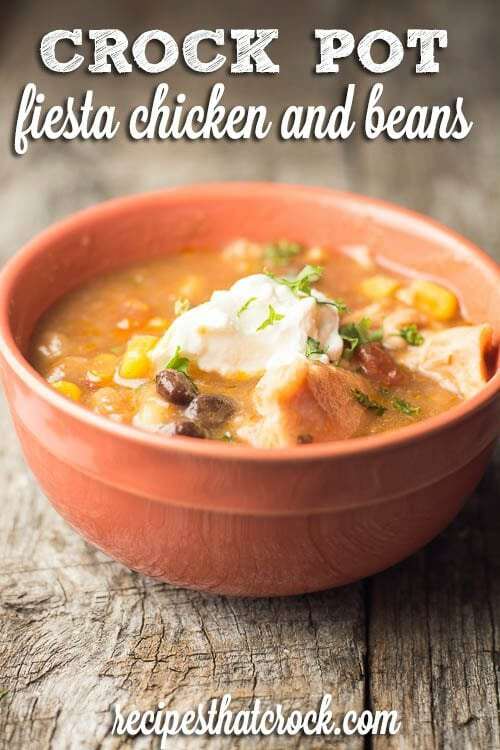 Crock Pot Fiesta Chicken and Beans - Recipes That Crock! This Crock Pot Fiesta Chicken and Beans recipe is a great one pot dish! It is perfect on its own, over rice or on a tortilla. I often say that you can tell a really good recipe when we make it more than once within a few days or weeks of trying it. A recipe has to be really good for us to make it over and over again when we have a long list of new recipes to try! This Crock Pot Fiesta Chicken and Beans definitely fits the bill. We have had it no less than 3 times this month! Truth be told, I wasn’t sure how we would like it because I am not always a fan of pollo (chicken) in my Mexican dishes… but the chicken in this dish is flavorful and fantastic! We found the original for this fantastic dump and go recipe in Gooseberry Patch’s Mom Knows Best Cookbook. The original recipe called for two cans of black beans but the rebel in me switched it to one can of black beans and one can of white chili beans. 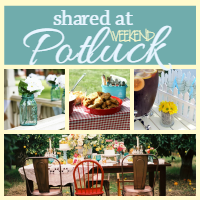 Great one pot dish! Perfect on its own, over rice or on a tortilla. Altered from Gooseberry Patch's Mom Knows Best. Season chicken and add to crock pot. I love the non-stick surface of this slow cooker for recipes like this, however, any 4-6qt slow cooker will work just fine. We don’t calculate them on the blog, but I think if you click the yum button, I’ve heard yummly calculates it for recipes there. Enjoy! Is there a reason the photo of the meal is not included when you print it out? For the fiesta chicken and beans recipe how many chicken breasts would you use in place of the thighs. Hi Marcy- I would use around 2 1/2 to 3lbs. Just make sure not to overcook the chicken breasts. Enjoy!